The Model 91 catalytic insert with a black front is our most popular selling really large wood insert. 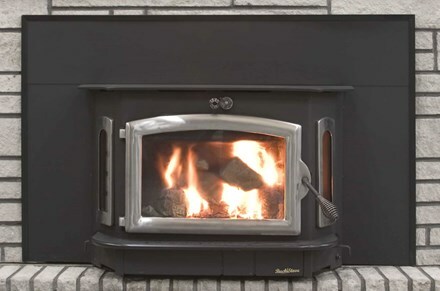 The extra deep Buck 91 easily accepts 21" logs loaded straight in, front to back, and easily heats up to 3200 square feet, more if really well insulated. Includes factory installed 3 speed, thermostatic front accessible blower, pull-out ash tray, and oversized, self cleaning glass door. Extremely high efficiency - rated at an astonishing 86%! For optional Pewter door, add $200.00. Set up as a freestanding stove with Queen Anne cast iron legs and "Buck stovepipe collar, add $249.95. We have used this model ourselves for 6 years, set up on stylish Queen Anne cast iron legs as a freestanding stove, to heat our huge showroom! Extremely long burn time with easy fire-starting with built-in "hot-shot" air tunnel that blasts a jet of super-heated air right at the base of the fire for the easiest and fastest fire-starting ever. Super heavy-duty construction.